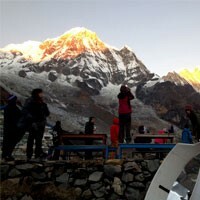 10 Days Everest view trek itinerary is including a full day Kathmandu sightseen tour and a spare day at Namche Bazaar. We make 7 days Everest view trek itinerary, 5 days Everest view trek itinerary, 8 days Everest view trek itinerary, 6 days Everest view trek itinerary also as per your time limit and the interests. The land of high mountains, rivers, and the lush green forests will be waiting for your arrival. On your arrival at Tribhuvan International Airport, our representative will be at the there to receive you and to transfer you to your hotel. Overnight stay at a hotel in Kathmandu. Day 02 : Pre-trip meeting and Kathmandu cultural sightseeing tour. Today, we conduct a small pre-trip meeting and complete your remaining formalities. Also, a short introduction program with the team members and the team leaders will follow next. After completing the session, we will do some cultural sightseeing around the Kathmandu valley. We will visit some famous historical places in Kathmandu like Kathmandu Durbar Square, Pashupatinath Temple, Boudhanath Stupa, and Swayambhunath Stupa. In the evening, we return back to the hotel. Overnight stay at a hotel in Kathmandu. Day 03 : Fly to Lukla (2840m.) trek to Phakding (2610m.) 3 hours. In the early morning, we will take a flight from Kathmandu to Lukla which flies over the high mountains with the enchanting views of the Everest and other mountains. The flight dives deep towards the Dudh Koshi valley. A flight for about 40 minutes will take us to Lukla. On reaching Lukla we will have our lunch and we will head towards Phakding. Overnight stay at Phakding. Day 04 : Trek from Phakding to Namche Bazaar (3440m. )6 hours. The trail continues along the north of the Dudh Koshi Valley and passes through the dense forests, crossing some local suspension bridges over the Dudh Koshi River before reaching the Monjo village. Completing the paper works at the entrance gate of Sagarmatha National Park we will ascend a bit further leading us to the village of Jorsalle. The trail further continues along the forested area offering us with the magnificent views of the mountains like Kusum Khangkaru (6367m), Thamserku (6608m), Everest (8848m), and Nuptse (7879 m) to lead us to Namche Bazaar. Overnight stay at Namche Bazaar. This day will be the rest day and we need to acclimatize to the thinning of the air at this altitude. We will do some exploration around the Namche Bazaar. It is one of the attractions of the Khumbu region and is a commercial hub. On our day of rest in the Mt. 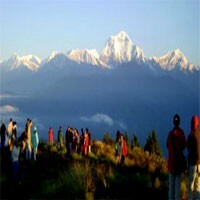 Everest View Trek, we will also visit Syangboche where we can get the clear views of the Mt. Everest (8848m) and others in the Everest vistas towering with paramount splendour. 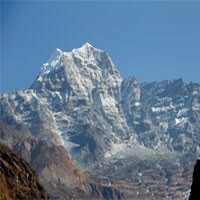 We will enjoy the beautifully preserved culture by Sherpas. Stay overnight at the hotel in Namche Bazaar. We will start our day with a pleasant walk along the beautiful forests on our way. Walking along the trail for about the one hour we will reach Phunki Tenga. The trail mostly passes through forested land areas and few water-powered prayers wheels taking us Tengboche. Home to Tengboche Monastery, we can enjoy the magnificent mountain views of Amadablam (6856m), Everest (8848m), Nuptse (7861m), Lhotse (8414m), and many other mountain peaks. Overnight stay at Tengboche. Day 07 : Trek from Tengboche to Monjo (2835m.) 5 hours. We will follow the same trail to descend back to Monjo. We will follow the trail passing through the dense forest areas until we will reach the Namche Bazaar and further descends to the Monjo. The trek follows the Imja River and traverses the forested trails along the national park. Exploring the ancient unique culture of Khumjung village, Buddhists traditions, and the rural lifestyle of the inhabitants of this region, this trekking route is an easier approach to view the world’s highest mountain range. Descending from Namche, we descend to Jorsalle and then to Monjo. Overnight stay at Monjo. Day 08 : Trek from Monjo to Lukla (2840m.) 4 hours. The descending trail along the forested landscapes and bridges over the Dudh Koshi River will take us to Lukla. Its trail is descending for four hours until we will reach Lukla. From Monjo, the trail reaches Bengkar and relishing views of Kongde range and Thamserku (6608m), we arrive at Lukla. Overnight stay at Lukla. Day 09 : Fly back to Kathmandu. Overnight at the hotel. Exploring the beautiful Lukla, we will take a flight back to Kathmandu. The flight passes over the Himalayas and slowly turns towards the hilly lands taking us to Kathmandu. On reaching Kathmandu, we will take you to the hotel and refreshments can follow. As we bid farewell to the Everest region in the Everest panorama trek, we can also plan for an extended trip to the Everest. Overnight stay at a hotel in Kathmandu. Day 10 : Free day in Kathmandu and farewell dinner with Frolic Adventure. This will be a leisure day at Kathmandu. We will do some last minute shopping in the street of Thamel and then visit some places nearby. In the evening, we will have our farewell dinner hosted by Frolic Adventure Treks. We can shop for gifts and souvenirs as we stroll around the streets of Thamel and Basantapur or can do an optional tour to Bhaktapur and Patan. Overnight stay at a hotel in Kathmandu. Day 11 : Departure to international airport for your final flight. It will be your last day in Kathmandu Valley after having your lunch we will drive you to the International Airport for your final departure bidding you a final goodbye.